SSAA’s Comprehensive Guide to Shooting & Hunting in Australia is an introductory publication intended for those new to the Sporting Shooters’ Association of Australia (SSAA) or to sports shooting and recreational hunting in general. 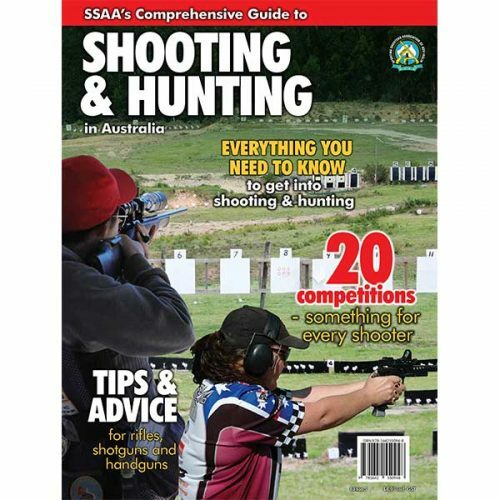 The high-quality glossy magazine showcases 18 of the SSAA’s popular shooting competitions (called ‘disciplines’), including Benchrest, Combined Services, Lever Action, Rifle Metallic Silhouette, Practical Shooting, Target Pistol and Working Gundogs, to help you with everything you need to know to get out there and a have a go at something new. The guide also features three important sections on rifles, shotguns and handguns, showing you how to identify their components and safely handle these firearms, as well as offering you tips to master various shooting positions and techniques.